Cannabinoids exert antiproliferative properties in a variety of malignant tumors, including pancreatic ductal adenocarcinoma (PDAC). In our study, we quantitatively evaluated the immunoreactivity for cannabinoid-1 (CB1) and cannabinoid-2 (CB2) receptors as well as for the endocannabinoid metabolizing enzymes fatty acid amide hydrolase (FAAH) and monoacyl glycerol lipase (MGLL). Furthermore, quantitative real-time RT-PCR for CB1, CB2, FAAH and MGLL in normal pancreas and pancreatic cancer tissues was performed. Levels of endocannabinoids were determined by liquid chromatography/mass spectrometry. Immunoreactivity scores and QRT-PCR expression levels were correlated with the clinico-pathological (TNM, survival, pain) status of the patients. Evaluation of endocannabinoid levels revealed that these remained unchanged in PDAC compared to the normal pancreas. Patients with high CB1 receptor levels in enlarged nerves in PDAC had a lower combined pain score (intensity, frequency, duration; p = 0.012). There was a significant relationship between low CB1 receptor immunoreactivity or mRNA expression levels (p = 0.0011 and p = 0.026, respectively), or high FAAH and MGLL cancer cell immunoreactivity (p = 0.036 and p = 0.017, respectively) and longer survival of PDAC patients. These results are underlined by a significant correlation of high pain scores and increased survival (p = 0.0343). CB2 receptor immunoreactivity, CB2 receptor, FAAH and MGLL mRNA expression levels did not correlate with survival. Therefore, changes in the levels of endocannabinoid metabolizing enzymes and cannabinoid receptors on pancreatic cancer cells may affect prognosis and pain status of PDAC patients. Here, we concomitantly analyze the expression of cannabinoid receptors and endocannabinoid metabolizing enzymes. Our results demonstrate a correlation between longer survival in pancreatic cancer patients, and low CB1 receptor or high FAAH as well as MGLL levels in tissue specimens. Tissue samples were collected from patients after pancreatic resections for PDAC (n = 40). Normal pancreatic tissue samples were obtained through an organ donor procurement program whenever there was no suitable recipient for pancreas transplantation (n = 10). Pancreatic tissues were immediately snap frozen at −80Â°C or formalin fixed and paraffin embedded. The use of human tissue for the analysis was approved by the local ethical committee (University of Heidelberg, Germany), and written informed consent was obtained from the patients. Immunohistochemistry was performed on paraffin-embedded sections of human pancreata (CB1/CB2: 10 normal pancreas, 40 pancreatic cancer tissues; FAAH/MGLL: 10 normal pancreas samples, 31 pancreatic cancer tissues) as described previously.29,30 Formalin fixed, paraffin embedded consecutive human pancreatic cancer tissue sections (3 μm) were deparaffinized in Roticlear (Roth, Karlsruhe, Germany) and rehydrated in progressively decreasing concentrations of ethanol. Antigen retrieval was performed by boiling tissue sections in 10 mM citrate buffer (pH 6.0) in a microwave oven for 15 min. The activity of endogenous peroxidase was blocked with 3% hydrogen peroxide in methanol for 10 min at room temperature. After the peroxidase block, slides were washed in wash buffer (1 Ã— TBS/0.1%BSA, pH 7.4). Non-specific binding sites were blocked by incubating the slides with 1 Ã— TBS/3%BSA for 30 min at room temperature. Sections were subsequently incubated with rabbit polyclonal anti-CB1, anti-CB2, anti-FAAH and anti-MAGL antibodies (all from Cayman Chemical, Ann Arbor, MI) at 4Â°C over night at antibody dilutions (in 1 Ã— TBS/3%BSA) of 1:150, 1:300, 1:150 and 1:200, respectively. Specificity controls included pre-adsorption of the primary antibody with the corresponding blocking peptide (1:1) for 1 hr at 37Â°C. After incubation with the primary antibodies, slides were washed twice with wash buffer containing 0.05% Tween20 and once with plain wash buffer. Secondary antirabbit antibody, HRP-labeled polymer (DakoCytomation, ready to use; Hamburg, Germany) was applied for 45 min at room temperature. Slides were then were washed twice using 1 Ã— TBS/0.1%BSA/0.05% Tween20 and once with plain wash buffer. The color reaction was performed applying DAB-chromogen/H2O2 substrate mixture (DakoCytomation, Hamburg, Germany) to tissue sections. Slides were counterstained in Mayer’s hematoxylin, washed in tap water, dehydrated in progressively increasing concentrations of ethanol, cleared in Roticlear and mounted with permount (Biomeda, Foster City, CA). Analysis and semiquantitative evaluation were performed using an Axioplan-2 microscope (Carl Zeiss, Jena, Germany). Immunoreactivity of CB1 and CB2 receptors as well as FAAH and MGLL on cancer cells and/or nerves was quantitatively evaluated according to intensity and area: the staining intensity of pancreatic cancer cells themselves was recorded as “no staining (0)”, “weak to moderate staining (1)” or “strong staining (2)”. The area of stained cancer cells was recorded as < 33% (1), 33–66% (2) or > 66% (3) of all cancer cells. These numbers were then multiplied resulting in a score of 0–6. Regarding intrapancreatic nerves, only the staining intensity (0–2; as for cancer cells) was recorded due to the generally low number of nerves in pancreatic cancer tissue specimens. Quantitative real-time RT-PCR (QRT-PCR) was performed on a second, larger cohort of 53 pancreatic cancer samples as previously described.31,32 Primers for CB1-receptor, CB2-receptor, FAAH and MGLL were obtained from Search LC, Heidelberg, Germany. CB1 receptor primers flank the sequence NM_016083 at nucleotide 926–1164; CB2 receptor NM_001841 at nucleotide 507–738; FAAH NM_001441 at 1706–1965 and MGLL NM_007283 at nucleotide 1112–1400. Statistical analysis was performed using the GraphPad Prism 4 Software (GraphPad, San Diego, CA). The Kaplan-Meier method and log-rank tests were used for survival analysis. Pain scores and endocannabinoid levels were compared using the Mann–Whitney U test. Statistical significance was set at p < 0.05. Results are expressed as mean Â± SEM. Immunohistochemical analyses of normal human pancreata revealed weak immunoreactivity for CB1 and CB2 in pancreatic acini, nerves, blood vessels and ductal cells (data not shown). Subsequently, CB receptor immunoreactivity on pancreatic cancer tissues was semiquantitatively evaluated and a combined score (staining intensity multiplied by the percentage of the stained area) was calculated. Tissue specimens were stratified accordingly into those with low CB receptor levels (represented by scores of 0–3) and those with high CB receptor levels (represented by scores of >3). Apart from the staining in the normal parts of the pancreatic cancer tissues, we observed CB1 and CB2 immunopositivity of stellate cells particularly in the vast areas of desmoplasia. Additionally, infiltrating mononuclear cells were immunopositive for CB2. In cancer cells of pancreatic cancer tissue samples, heterogeneous immunoreactivity was observed: whereas a low combined score of CB1 staining intensity was observed in 24 out of 37 samples, 13 out of 37 samples showed a high CB1 score. For CB2, there was a low staining score in 18 samples and a high immunoreactivity score in 19 tissues. Furthermore, cancer cells within single tissue samples showed various extents of CB1 and CB2 staining, ranging from no immunoreactivity to strong immunoreactivity (Figs. 1a–1c and 1g–1i). Consecutive sections which were incubated with the primary antibodies and the corresponding blocking peptide showed the specificity of the staining (Figs. 1d–1f and 1j–1l). Semiquantitative analysis of staining intensities revealed a statistically significant negative correlation between the extent of CB1 immunoreactivity of pancreatic cancer cells and patient survival (p = 0.0011; Fig. 2a). The median survival in the group with low CB1 staining in cancer cells was 16 months, versus 6 months for the group with a high combined CB1 staining score. For CB2, however, no such correlation was observed (p = 0.869; median survival 10.75 versus 12.5 months; Fig. 2b). Furthermore, there was no correlation between tumor grade/TN(M) status and pain score of the patients (Spearman rho: pain score versus grade: r = −0.25, p = 0.3; pain score versus T status: r = −0.21, p = 0.36; pain score versus N status: r = 0, p = 1.0). Since all patients were resectable, none had distant metastases at the time of the operation. In accordance with the published literature on pancreatic cancer, the nodal status correlated significantly with overall survival (Spearman rho; p = 0.016). Immunohistochemistry of normal human pancreata revealed weak immunoreactivity for FAAH and MGLL in pancreatic islets and nerves (data not shown). In pancreatic cancer tissues, mainly pancreatic cancer cells were immunopositive for FAAH and MGLL while the stroma was unstained. Enlarged intrapancreatic nerves were heterogeneously immunoreactive for FAAH and MGLL. Quantitative evaluation of pancreatic cancer cells in tissue specimens demonstrated highly variable FAAH and MGLL immunoreactivites (Fig. 3). Few samples (3 out of 29) were unstained using an anti-FAAH antibody (Fig. 3a), 13 were moderately stained (Fig. 3b) and 13 showed a strong staining for FAAH (Fig. 3c). Similarly, 3 out of 31 samples were negative for MGLL (Fig. 3g) whereas 12 tissues were moderately positive (Fig. 3h) and 16 samples showed strong MGLL staining (Fig. 3i) in pancreatic cancer cells. Figures 3d–3f and 3j–3l show the corresponding negative controls which were incubated with the primary antibodies and the corresponding blocking peptide. Subsequent survival analysis demonstrated that both low cancer cell FAAH and MGLL were correlated with a shorter survival of the patients (Figs. 4a and 4b; p = 0.036 and p = 0.017, respectively). The median survival of patients with low cancer cell FAAH was 10 months as compared to 19.1 months of patients with moderate-to-strong FAAH immunoreactivity. Similarly, patients with low MGLL survived in median only 8 months whereas patients with moderate-to-strong MGLL staining in pancreatic cancer cells had a median survival of 21.8 months after pancreatic cancer resection. However, these results were not confirmed in the quantitative RT-PCR showing no significant differences between FAAH/MGLL mRNA expression levels (below/above median) and survival (Figs. 4c and 4d; p = 0.874 and p = 0.6, respectively). This may be due to the low number of cancer cells in pancreatic cancer tissue specimens (which mainly consist of a fibrotic reaction—desmoplasia). To determine potential correlations between CB receptor levels and the extent of pain, PDAC patients were stratified according to low or high CB receptor levels in pancreatic nerves (no staining: 0; moderate staining: 1; strong staining: 2). A clinical pain score was available for 27 of 40 patients. For CB1, 18 out of 27 tissue specimens showed low receptor levels in nerves, whereas for CB2, 21 out of 27 demonstrated low receptor staining intensities. Subsequently, a correlation analysis of nonparametric data (Spearman rho) revealed an inverse correlation between CB1 and CB2 receptor levels and pain (p = 0.041 and p = 0.044, respectively). After stratification into 2 groups (low and high CB receptor levels), patients with high CB1 receptor levels had a significantly lower pain score than patients with low CB1 receptor levels (p = 0.012; Fig. 5m). For CB2 receptor levels, however, there was only a nonsignificant trend toward less pain in patients with high CB2 staining intensities (p = 0.35; Fig. 5m). Since low CB1 receptor levels were associated with increased survival but at the same time with a high pain score, we tested a potential general relationship between pain and survival in our patient collective. A log-rank test of patients with low and high pain scores revealed a statistically significant difference in survival (median survival 11 months in the group with low pain scores versus 24.5 months in the group with high pain scores; p = 0.0343; Fig. 5n). Intrapancreatic nerves in pancreatic cancer tissue samples were also heterogeneously stained when using anti-FAAH and anti-MGLL antibodies (Fig. 6): regarding FAAH, 8 samples were unstained (Fig. 6a), 14 samples were moderately (Fig. 6b) and 7 samples were strongly stained (Fig. 6c); Out of 31 samples stained with MGLL, no nerve structures were detectable in 2 samples. Out of the remaining 29 samples, 11 samples showed no immunoreactivity (Fig. 6g), 11 samples were moderately (Fig. 6h) and 7 samples were strongly stained (Fig. 6i). Figures 6d–6f and 6j–6l show the corresponding negative controls for which the primary antibodies were pre-adsorbed with the respective blocking peptide. To test whether FAAH and MGLL are associated with pain in pancreatic cancer, a quantitative evaluation of the immunoreactivities of these enzymes was carried out. This analysis revealed that there were no differences in regard to the pain score when comparing patients with no FAAH/MGLL immunoreactivity and patients with FAAH/MGLL immunopositivity on intrapancreatic nerves (Fig. 6m; p = 0.06 and p = 0.582). Cannabinoids have just recently been shown to exert growth inhibitory properties in pancreatic cancer.16,17,23 Therefore, the most important new findings of our study are (i) a correlation between low cancer cell CB1 receptor or high FAAH/MGLL levels and survival, (ii) an inverse correlation between CB1 receptor levels on intrapancreatic nerves and the pain status of the patients and (iii) an inverse correlation between pain symptoms and overall survival of pancreatic cancer patients. Although there was no difference in endocannabinoid levels between healthy people and patients suffering from pancreatic cancer, cannabinoid receptors, FAAH and MGLL levels showed a significant variation. Despite heterogeneous staining intensities, levels of cannabinoid receptors were generally upregulated in pancreatic cancer suggesting an active role of these receptors in pancreatic carcinogenesis. In contrast to our findings in acute pancreatitis where there was upregulation of the endocannabinoid system, we did not find any changes in endocannabinoid levels in pancreatic cancer tissues. This may be due to the low number of samples tested but may also reflect the strong desmoplastic reaction in pancreatic cancer. In the vast areas of peritumoral desmoplasia, the proportion of cancer cells to stroma decreases. Therefore, although the endocannabinoid system seems not to be influenced by pancreatic cancer, one may speculate that the local concentrations of endocannabinoids in the vicinity of the tumor cells might be significantly altered. However, with the currently used techniques, such changes cannot be measured. 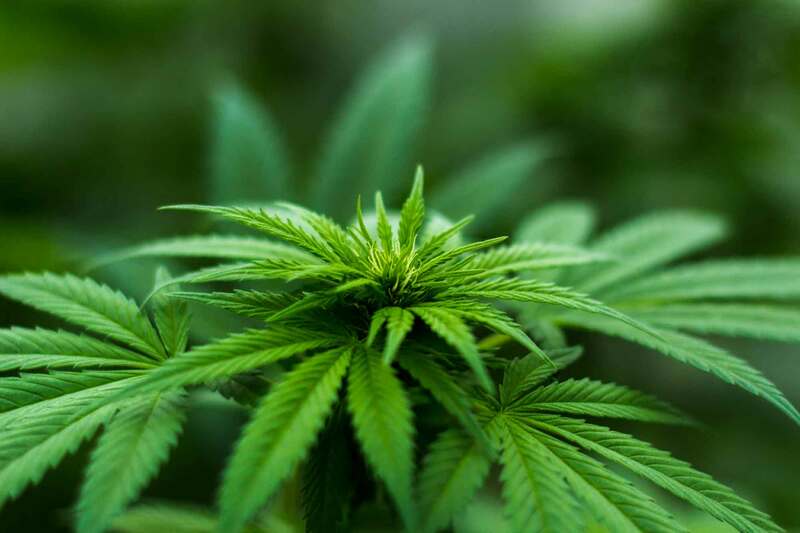 Thus, we have to base the conclusions of our findings mainly on the status of the cannabinoid receptors and the cannabinoid metabolizing enzymes. We found an inverse correlation between CB1 receptor levels and survival as well as a correlation between FAAH or MGLL cancer cell levels and survival. This is of particular interest since these results may partially contradict the reported antiproliferative effects of cannabinoids on pancreatic cancer growth.16,17 Xu et al. reported that overexpression of CB1 and CB2 correlated with an improved prognosis of patients with hepatocellular carcinoma.36 These results point toward different roles of cannabinoid receptors in different malignancies. Furthermore, since the activity of the endocannabinoid system, its receptors and metabolizing enzyme is a snap-shot taken during the surgical resection of the tumor, subsequent regulatory mechanisms which may occur as a consequence of a potential treatment using cannabinoids are not taken into account in our analyses. Furthermore, heterogeneous expression patterns of proteins of the cannabinoid system may preclude their potential use as clinical prediction markers. This holds particularly true since specificity and sensitivity of such a test will be strongly influenced by the respective pathologist who conducts the semi-quantitative analysis. Therefore, computerized imaging analysis systems may provide a better way to reliably quantify protein levels of these proteins for the standardized clinical application. As can be expected based on what is known about CB receptor function in nerves,37,38 there was an inverse correlation between the CB1 receptor expression and pain symptoms of the patients. Similar results were obtained for CB2, although these did not reach statistical significance. Therefore, cannabinoid receptors may be involved in the development of pancreatic cancer pain. However, a lack of correlation between FAAH/MGLL levels and pain scores suggests that endocannabinoid inactivation through FAAH or MGLL seems not to be involved in pancreatic cancer pain. Interestingly, we also observed an inverse correlation between pain symptoms and survival. This finding may be explained by the fact that pain is a warning symptom leading to earlier diagnosis of either local recurrence of the tumor or metastasis. To analyze the value of pain as a warning symptom, we compared patients’ TNM status and tumor grade with their pain scores. Our correlation analysis revealed no differences between groups with high and low levels of pain. However, both the tumor grade and the T(N)M status are crude classifications providing little (to no) information on the microscopic tumor burden or biological behavior (other than the nodal status, which is the only prognostic factor in resectable pancreatic cancer and also in our patient collective). Taken together, our observation could—together with other reports—build the basis for a clinical testing of cannabinoids in the treatment of pancreatic cancer. Furthermore, our data strengthen the perception that cannabinoids may be useful in treating pancreatic cancer-associated pain. I just joined and if there is something I could have done for my wife and her Pancreatic Cancer befor she Passed other than just taking care of her and being there till the end ILL ((( SCREEEEM )))))! Just how is it that Our Federal Government can with hold something as harmless Yet Proven Beneficial as a Herbal remedy that cant kill you but make pain and discomfort more tolerable IN PLACE OF HARMFUL DEADLY DRUGS THAT ARE PROVEN KILLERS AND ARE VERY ADDICTIVE ! It just is wrong to keep some thing so good from so many to stop people from using something that cant harm anyone and in the end they use other things that are much more deadly and addictive ? WTF ? The way I see it our laws are outdated and absurd and are making the U.S. Look like fools governed by fools !